Europe in the 19th century was the domain of the Habsburg family. With members seated on nearly every throne on the continent, their influence was immense. From the mid 1800s to the end of the century, perhaps no member was more discussed, idolized, and reviled than Empress Elisabeth of Austria. Married at 15 to Emperor Franz Joseph, leader of the Austro-Hungarian Empire, Elisabeth, or Sisi, was the subject of Allison Pataki’s bestseller The Reluctant Empress, which chronicled the early years of her reign. 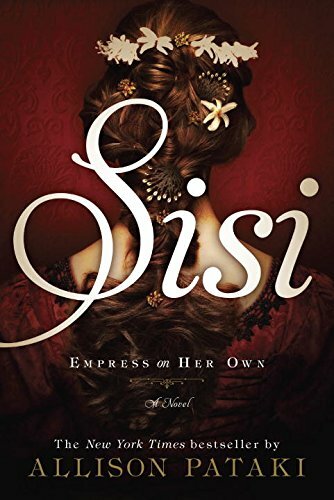 Sisi has returned in Pataki’s follow-up, Sisi: Empress on Her Own. Pataki begins this novel with Sisi jealously guarding her time, and her fourth child, at her Hungarian estate. Though it wouldn’t be a bad idea to have some background on the empress’ early life, it is not necessary to have read Pataki’s earlier book to understand this novel. The Sisi introduced here is strong, athletic, and educated, and a fierce protector of the single child she has been allowed to raise out of the four she produced with Emperor Franz Joseph. Pataki’s thumbnail sketch of Elisabeth’s strained relationship with her husband and mother in law is punchy, dropping the reader comfortably into Sisi’s mindset at the end of the 1860s. Gossipy passages about the state of the empire and the Imperial household keep information drops (inevitable in a novel of this sort) interesting and lend themselves to the quasi-romance novel treatment of Pataki’s subject. Languorous passages about Sisi’s attraction first to Count Andrassy and then Colonel Middleton could come right out of a Barbara Cartland novel; similar languor is far more distracting when dedicated to Empress Elisabeth’s costuming, hairdressing, and meals. Though dedicated readers of romantic fiction will likely find such drawn out descriptions filled with sighs and flutters and pique, comforting, readers of serious historical fiction could find them annoying. The confluence of history and fiction is a source of uneasiness in this novel. Pataki clearly intends for Elisabeth to be a heroine, and a romantic heroine at that. While that outlook is perhaps supportable in the empress’ early years, it becomes more and more difficult to justify as Sisi ages. The author provides enough history (and, indeed, includes an entertaining author’s note as to her sources) to agree that a young Elisabeth would understandably chafe under strict Habsburg formality. Once Sisi has been empress for two decades, however, her obstinacy in the face of duty reads as less charming than petulant. Pataki glosses over troubling aspects of Sisi’s behavior: her obsession with her appearance, flighty fitfulness in accomplishing her duties as empress, and sporadic stabs at motherliness, even after her overbearing mother-in-law passes away, are brushed aside in the interests of keeping Sisi sympathetic. Much like the famous Austrian ‘Sissi’ films of the 1950s, Pataki seems less concerned with historical accuracy than entertainment. She has a good grasp of her prospective readers, name dropping both the Spencer and Middleton families in a nod to those partial to princesses. Sisi is not completely romantic fantasy (and a good thing, because the instances of romance novel-worthy swoon tend to be overdone in purple prose and underplayed in terms of actual romance). Pataki does a nice job of including historical documents in her characters’ conversations and to develop motivation. Sisi herself, while not historically accurate, is a three-dimensional character, and Pataki has also done a lovely job in presenting the story of Sisi’s tragic son, Prince Rudolf. The rest of the characters tend toward the flat, until the end of the novel, when Emperor Franz Joseph is allowed to breathe. Sisi: Empress on Her Own is a difficult book to quantify. Though Pataki’s pacing and description are worthy of a Georgian epic, it may not have enough actual romance to satisfy someone who primarily enjoys the romance genre. On the other hand, though her history is good where it is followed, Pataki makes enough changes to the historical account and Empress Elisabeth’s character that someone who enjoys serious historical fiction could be put off. The readers of the former genre would be better off sticking to Cartland and Mary Balogh, and readers of the latter will likely stick to Hilary Mantel and Alison Weir’s historical fiction, leaving Allison Pataki’s novel in a netherland between the two. Pataki does provide a bibliography that should satisfy anyone who wants to learn about the fascinating Habsburgs; a reader would be wise to mine this resource to put Sisi in perspective.